A new intercity bus option from the same company that runs Megabus is launching Dec. 1. The route runs from Virginia Tech's campus to D.C.'s Union Station with other stops along the way, including one at Dulles International Airport. 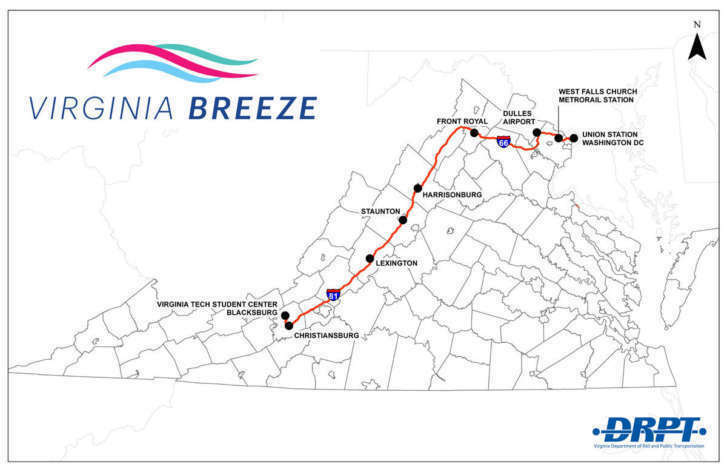 WASHINGTON — Students and staff at schools such as Virginia Tech, VMI and James Madison University as well as others who live along Interstate 81 will have a new option for trips to and from the D.C. area when a new intercity bus service launches Dec. 1. Staunton’s Martin’s on Richmond Ave.
A bus will leave Blacksburg at 8 a.m. each morning to arrive at Union Station at 2:30 p.m. A southbound bus will leave Union Station at 9:20 a.m. each day to arrive in Blacksburg by 3:40 p.m., Virginia’s Department of Rail and Public Transportation said. The 56-seat buses will include free Wi-Fi and power outlets, and will be provided through Coach USA, the same company that owns Megabus. One-way tickets between Blacksburg and Union Station are expected to cost around $50, although prices will vary based on the day of the week and time of year. Tickets must be purchased online. The website for the service is expected to launch soon.